SUPERSUB Trae Coyle came off the bench to net a hat-trick as Hampstead beat Primrose Hill Rovers 6-1 in the Under-8s League. Joe Antoni scored a contender for goal of the season to give Hampstead the lead with a stunning free kick. Primrose Hill battled back to level through Laurie Mills, but Coyle’s clinical finishing and strikes from Mackie Bruce and Colby Arnold made it nine wins out of nine for Hampstead. Primrose Hill United also picked up three points with an impressive 4-0 victory over Chapel Boys. Jonah Perez struck twice, while Ethan Novak and Theo Noble were also on target. 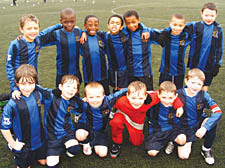 The only other Under-8s game saw Brunswick beat Highgate Rangers 3-2. Skipper Freddie Coulman led Isledon Wolves to a creditable goalless draw against league leaders Hampstead in the Under-9s North Division. Both sides had chances to win the game, with Eliezer Kafuti going closest for Wolves while Hampstead had a goal-bound effort cleared off the line by Max Stipanovsky. Islington Tufnell Youth are a point clear with a game in hand in the Under-13s ‘A’ League after they stormed to a 9-3 victory over Brunswick. Show-stopper Alfie Fricker scored five goals, while George McLean, Kaleb Sofer, Malik Marland and Liam Magwood were also all on target. In the Under-14s League, title chasers Isledon Wolves and Brunswick played out a an entertaining goalless draw. The result leaves Wolves, Lyndhurst and Brunswick all tied on 23 points after 10 games.